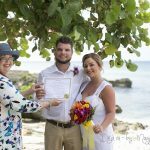 This couple from Minneapolis, Minnesota eloped to Cayman to get married, and stayed at the Marriot Resort. They chose our "Tropical Splendour" wedding package, and their wedding took place at sunset at My Secret Cove. 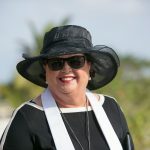 As you know, Trisha's Roses is our florist, and even though I see their flowers just about every day, I still like to compliment the ladies for a consistently good job. If you want specialist flowers, remmber I can special order them for you. Trisha's Roses bring in their flowers from Holland and they are always beautiful and fresh. Our Tropical Splendour wedding package includes, champagne, cake and wedding florals as well as all legal requirements. Last appointment for a Sunset Wedding in the winter season is 5:30 pm. Night falls quickly now, this photo is taken about 5:45 pm. 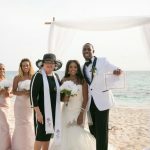 You don't have to have a big group to have a beautiful sunset wedding in the Cayman Islands. We can provide the two witnesses required by law. Call us to book your Cayman Wedding today +1 (345) 9499933. 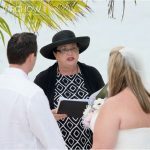 Simply Weddings is the first choice for wedding services in the Cayman Islands, we are a full service company located in George Town, Grand Cayman and conduct wedding ceremonies for cruise visitors, stayover visitors, and residents.